2016 might have been the year virtual reality entered the mainstream, but 2017 will likely be the year it finds its stride with even more companies showing interest in the technology, including Lenovo. At CES 2017, Lenovo has revealed a prototype of the VR headset it’s aiming to release later this year, though there’s no specific date attached to it just yet. The headset is one of several Windows 10 headsets being created to work on Microsoft’s Windows Holographic platform, meaning it’ll be able to run every Windows Store application and at relatively attainable minimum specs. The headset has two front-facing cameras, which enable it to provide room-scale VR experiences with ease, but we wonder if there’s also a chance these cameras could be used to integrate some HoloLens and mixed reality software too. 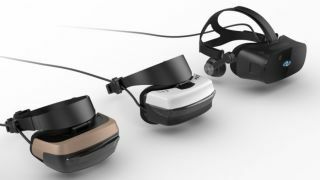 According to Lenovo, its headset uses two 1440 x 1440 OLED panels for display which would make it higher resolution than the current most high-end headsets – the Oculus Rift and the HTC Vive. The prototype Lenovo is showing at CES isn’t a working one, so unfortunately we can’t get a sense of exactly how the headset’s software will look and work in comparison to others on the market just yet. We can, however, get a feel for how the design of VR headsets is changing. Compared to other room-scale VR headsets like the Oculus Rift and the HTC Vive, Lenovo’s offering is notably smaller and lighter. According to Lenovo, it’s aiming to have the final headset weighing in at 350 grams, which is significantly lighter than the HTC Vive which weighs 550 grams. It’ll also change the way the headset’s weight is distributed across the wearer’s face, balancing most of the pressure across the forehead like PlayStation VR rather than using the basic straps which give the bridge of your nose an Atlas-like role on your face; this should make Lenovo’s headset more comfortable to wear for longer periods. As well as being lighter on the face, Lenovo plans to make its headset lighter on the wallet, too, saying that though a final price hasn’t been decided just yet, it won’t cost more than $400 (around AU$550, or £325). The goal is to have the price come in at between $300 and $400, though closer to the $300 mark if possible. It’ll be a while before we see Lenovo’s VR headset on shelves but it’s certainly one to keep an eye on.